Overall Rating: 9 - just what the ERTL kit needs to make it stand out. ERTL's Galaxy-Class USS Enterprise-D is a decent enough kit, still readily available even though it's currently out of production. Big enough to light, and big enough to super-detail, it's a favorite of modelers. That's one reason why Federation Models keeps making aftermarket parts for the kit. Federation's latest offering enables you to open up the shuttlebay and actually show off something more than a blank deck. 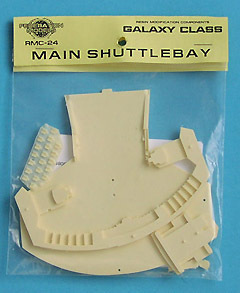 It includes five resin pieces for the deck and individual shuttle "stalls", plus 20 tiny shuttles and 2 "Speedboat" shuttles. Decals provide the deck markings. A comprehensive - if short - instruction sheet rounds out the package. As we've come to expect form this company, the casting is quite good. There were no defects other than a little easily-cleaned flash in my sample. Detail is sharp enough, and certainly adequate for the scale. Note that while the bulk of the shuttles come attached to wafer of resin, they are very easily removed -- so easily, in fact, several were already adrift when I first opened the bag. Decals are ALPS-printed by JTGraphics. They appear adequately opaque, and thin enough to conform to the raised surfaces (though I'd slice them up rather than try to mash down with decal solvent). 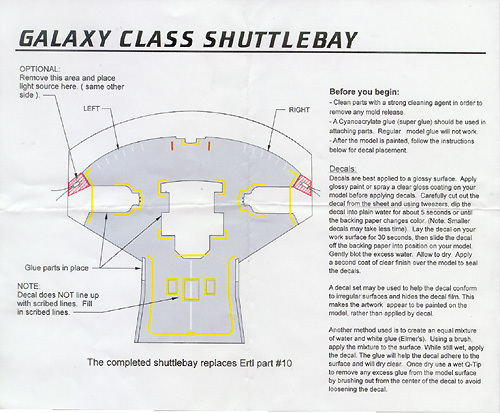 The instructions state that you need to fill in the engraved detail on the main deck floor, as it is in accurate and the decals do not conform to its shape. Easily done - though why it wasn't done to the master is puzzling. 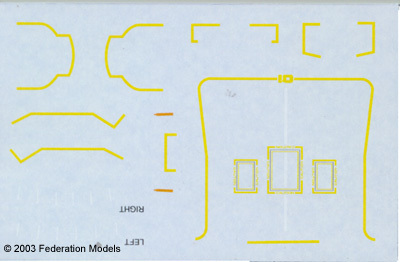 The instructions consist of a placement diagram that doubles as paint guide and decal placement guide, plus generic assembly and decalling tips. They are not clear on where the two small rectangular supports are to be placed, nor what you need to remove (if anything) on the ERTL kit. They do hint at where LEDs may be placed to illuminate the bay, if you so choose. Is it accurate? I don't have a technical manual or blueprint of the deck to say for certain. I will say that it certainly looks the part. 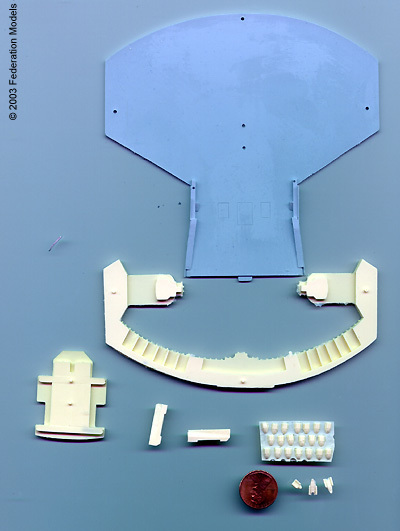 Federation has produced a simple conversion that should be quite eye-catching when incorporated into your ERTL Enterprise-D. As the pieces replace pieces already in the kit, it looks simple enough to install that I can safely recommend this to anyone with a few models under their belt that wants to give "super-detailing" a try. 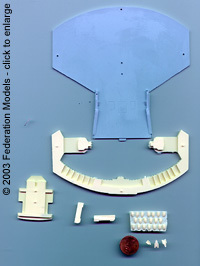 Many thanks to Federation Modelsfor providing the review sample. Manufacturers and retailers, interested in getting your wares reviewed and publicized on a site averaging 3500+ readers a day? Contact us! Please click here to see the build up review of this kit. This page copyright © 2003 Starship Modeler. First posted 13 February 2003. Last updated on 7 April 2003.